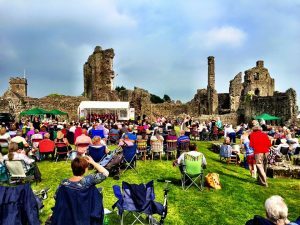 Steventon Choral Society was the first English choir to perform at the annual Choirs in the Castle charity concert at Coity Castle near Bridgend in south Wales. 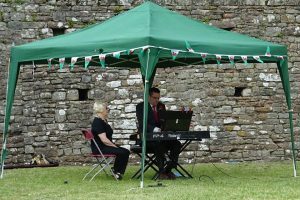 This year’s event, held on Saturday 4 June, raised over £4,000 for Y Bont, a Bridgend-based charity which supports families with disabled children. 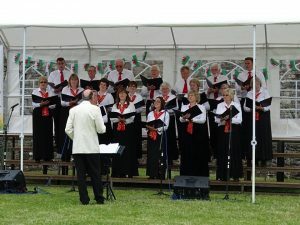 The audience was very warm and welcoming, and clapped along with the livelier numbers. 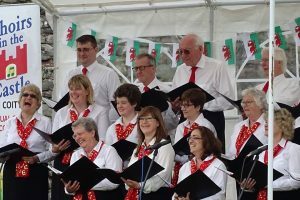 As well as Steventon Choral Society, the lineup featured Tenovus Choir, Maternal Harmony, Bois Geotre Hen A’r Cylch, Cantorion Ceoty, Rechoir and the South Wales Male Choir.